Cactaceae etc. 8(1): 8-9. 1998 1999 cf. Repert. Pl. Succ. (I.O.S.) 49: 15 (1998 publ. 1999). Accepted Scientific Name: Echinocactus horizonthalonius Lem. Cact. Gen. Sp. Nov. et Sp. 19. 1839 Lem. Origin and Habitat: Ejido Soledad, Nuevo León, Mexico. Echinocactus horizonthalonius var. centrispinus Engelm. Echinocactus horizonthalonius f. montruosa hort. Echinocactus horizonthalonius var. obscurispinus Rud.Mey. Echinocactus horizonthalonius var. nigrispinus hort. Echinocactus horizonthalonius cv. Albinous (Yellow form) hort. Echinocactus horizonthalonius cv. Sirotoge Suiheimaru hort. 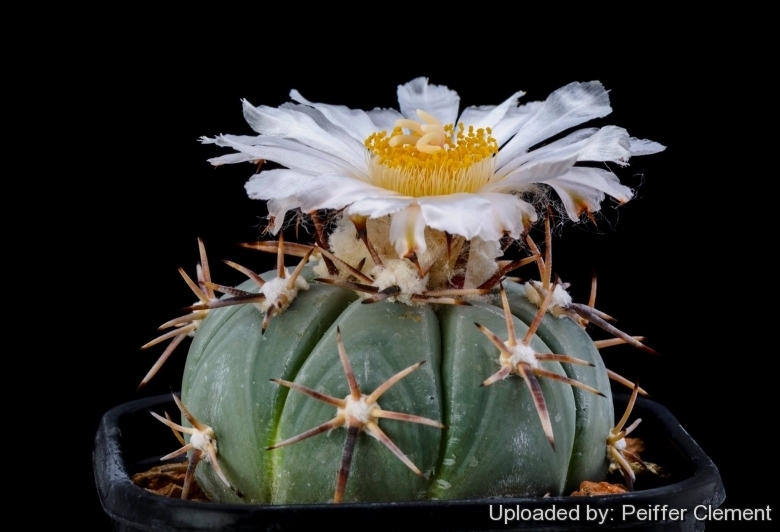 Description: Echinocactus horizonthalonius v. subikii is a rare, very stunted, bluish frosted and pure white Flowering form (but it can also be pink). 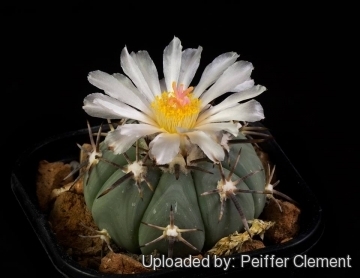 Echinocactus horizonthalonius Lem. : It is a relatively small barrel cactus that normally grows unbranched. The body of this plant is a chalky blue colour, and some forms have magnificent spines. Echinocactus horizonthalonius var. minimus: even very small plants are able to flower. Distribution: Cedral towards Esacion Vanegas, San Luis Potosi, Mexico. Echinocactus horizonthalonius subs. nicholii (L.D.Benson) Doweld: Stem eight- ribbed, pale grey-green to bright blue-green, up to 50 cm tall and 20 cm across. Distribution: Sierra del Viejo, Sonora (Mexico) and Pinal County, Arizona (USA). Echinocactus horizonthalonius cv. Albinous (Yellow form) hort. : ( Chlorophylless form) Stem with a bright yellow overall appearance and grey/red contrasting spines. Echinocactus horizonthalonius cv. Sirotoge Suiheimaru hort. : Short spined mutant selected in Japan.